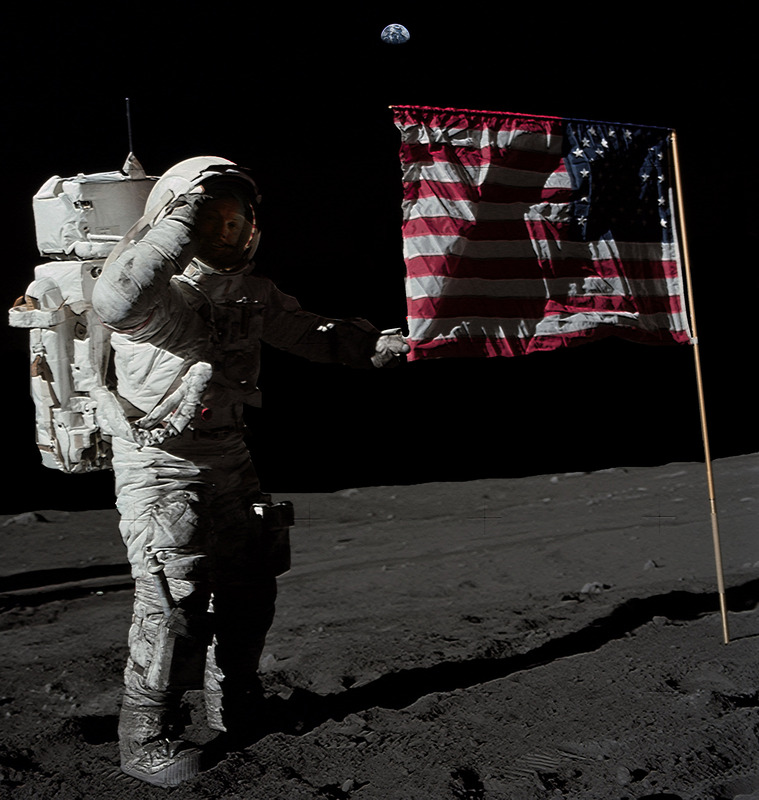 Apollo 11 and Apoll0 17 composite portrait of Neil Armstrong saluting the U.S. Flag by Stuart Atkinson. Image from NASA. Neil Armstrong‘s first step on the moon made him famous, but his “one small step for man… one giant leap for mankind” immortalized him. Today, August 25, 2012, GeekMom, NASA, America, and the entire world, lost a great man. Neil Armstrong passed away today, at the age of 82, of cardio-vascular complications after undergoing heart-bypass surgery. Armstrong lived in Cincinnati, Ohio, with his wife Carol. Neil Armstrong was a retired naval aviator when his he was chosen to be part of the second class of astronauts. After so many years as a test pilot, he was an easy choice for such a prestigious position, especially since he would be the first civilian aviator selected. Armstrong’s first command was also his first space flight as part of the Gemini 8 mission. The mission included the first ever docking between two spacecraft, and was successfully completed after only 6.5 hours in orbit. The mission was cut short after a malfunction in the attitude control system that required an emergency re-entry before the panned extravehicular activities could be completed. Armstrong’s second and final mission to space was as commander of Apollo 11, the first mission to land on the moon. On July 20, 1969, Neil Armstrong became the first of only twelve men to ever walk upon the lunar surface. Shortly after the resounding success of Apollo 11, Armstrong announced that he didn’t plan to ever fly in space again. After retiring from NASA, Neil Armstrong became a professor in the Department of Aerospace Engineering at the University of Cincinnati where he taught for eight years. After abruptly resigning his position with no explanation, Armstrong retired from all public activities and has remained that way for most of the rest of his life. He was vehemently opposed to the use of his likeness or persona for others personal gain and often took individuals or companies to court in an effort to preserve his privacy and identity. GeekMom wants to send our condolences to the entire Armstrong family on the loss of such an icon. Just take solace in the fact that while Armstrong may have passed from Earth, his legacy will forever be imprinted on the heavens.